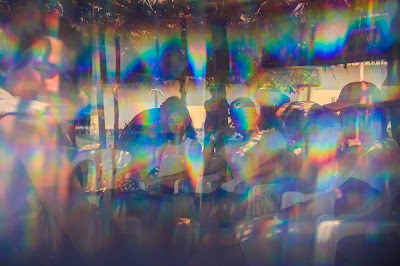 June's We're All Ears Challenge inspiration is the kaleidoscope. This reminded me of a simpler time in the past when I was a child. I am talking about back in the day when there was no Internet or television. I was 5 years old when my family got a black and white television. There wasn't colored television. A kaleidoscope was pretty exciting. Even though this handheld device meant you had to manually turn a tube of colored bits of glass to make ever-shifting patterns and colors, it brought lots of enjoyment! I remember my mother cross stitching a kaleidoscope for my children. The cross stitching was on the outside of course. I was in a panic over making earrings for this challenge. I would like to have done something with polymer clay, but I'm not there yet. I thought of a pair of earrings that I made awhile back. They were made of paper. I went to my go to source of creative materials--Etsy and located kaleidoscope paper images. There were so many choices I needed to decided on a specific size. I went with 1 inch circles. I also wanted a variety of colors. I purchased the paper on Etsy and downloaded it and printed 4 sheets on heavy, white card stock. I decided early on that these beads would have pattern on front and back. I also thought about putting them into bezels. 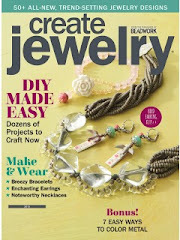 If you are considering doing a project similar to this, you might consider using bezels at this point. I used a one inch circular punch on them. 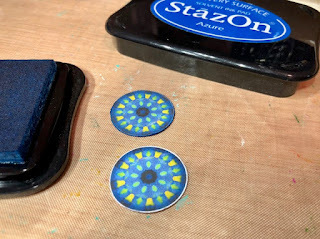 I brushed on some Mod Podge on the non pattern side and put them together. I let them dry thoroughly. This left a little white around the edges which I darkened with permanent ink. I used Mod Podge matte. Here you can decide if you prefer a glossy finish versus matte. I put some permanent ink carefully around the edges of the paper. 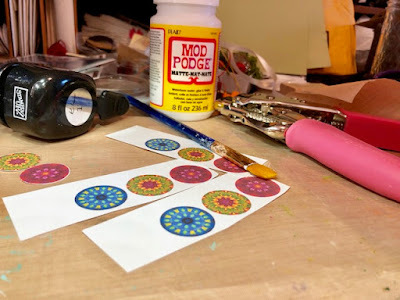 This is where you apply the Mod Podge with a brush to the paper circles. This has the effect of sealing and protecting the paper. It also was the added effect of deepening the colors and gives the earrings a bit more weight. I put on 4 coats of Mod Podge on each side and around the edges. 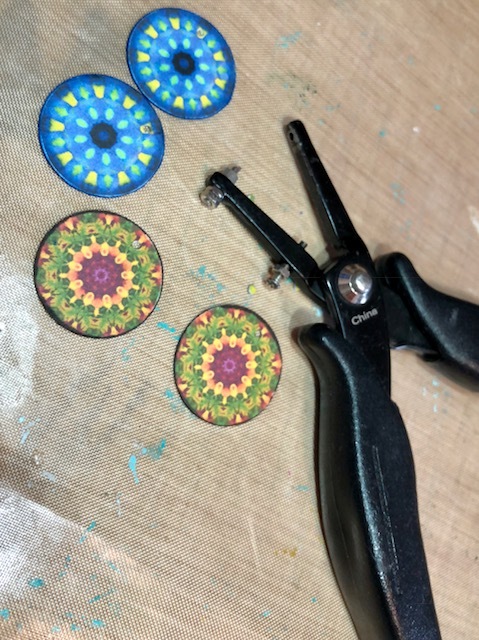 The last step is the best-designing the earrings. I had the option of putting in however many holes I wanted anywhere. 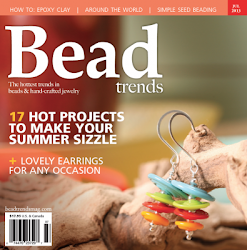 I used a metal punch because it cuts tiny holes easily through the paper beads. 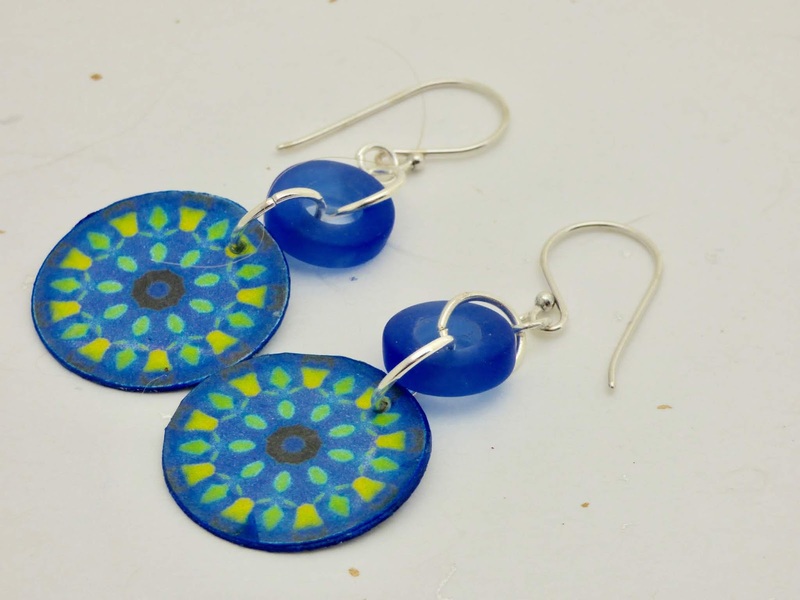 The blue kaleidoscope earrings are perfect as an eco-friendly fashion accessory. These blue and yellow paper earrings are for someone who enjoys repurposed, ooak, or unique earrings. They also are perfect for a first anniversary which is the paper anniversary. Since the blue patterned components are very light weight, this offers lots of design opportunities. 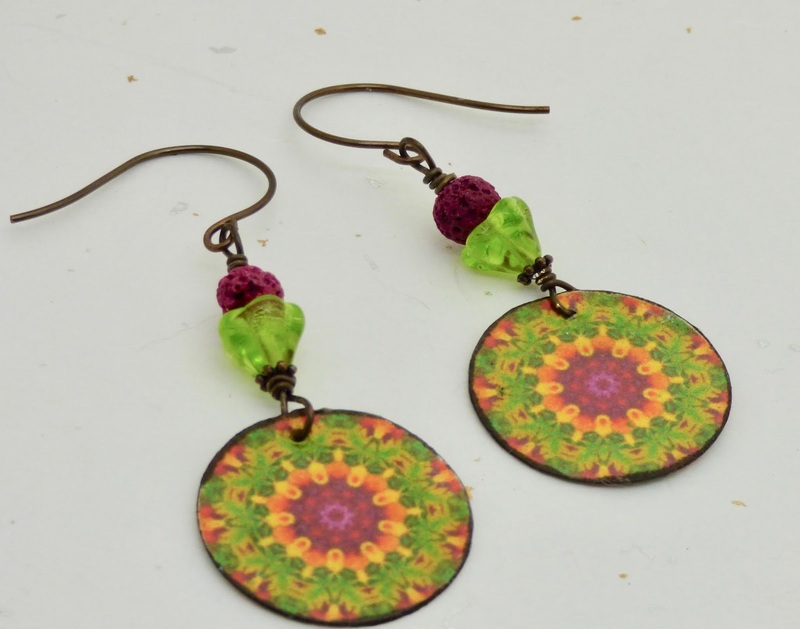 I made these chartreuse earrings by starting with chartreuse and pink kaleidoscope patterned paper. Once again I put some permanent brown ink carefully around the edges of the paper to give an antiqued look. I added chartreuse glass beads and pink lava rock beads. Vintaj ear wires help give the earrings a vintage look. What do you think of my kaleidoscopes earrings that began with paper ? Thanks for stopping by and please visit other participants in this challenge and see what they created. These are gorgeous! I totally love the idea and your execution of it. 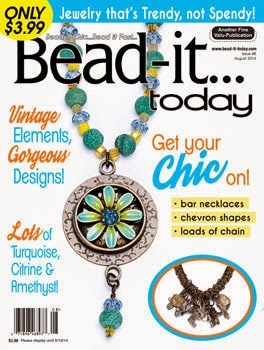 This is so creative and the patterns and colors are really beautiful! Gorgeous earrings! What a good idea!!!! They are gorgeous! I love what you did here and appreciate the mini-tutorial! 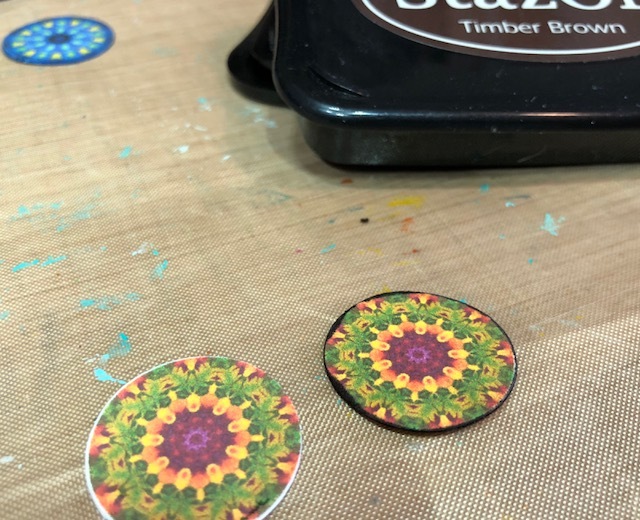 Your paper kaleidoscope charms are just wonderful and oh-so-perfect for the challenge! These are wonderfully retro. 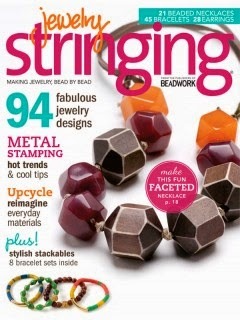 Perfect for the challenge and great color choices.